Beautiful porject and creations with lovely colors !!!! Your Sweat Pea Afghan is just beautiful! I love the inspiration for your Around the Bases blanket. 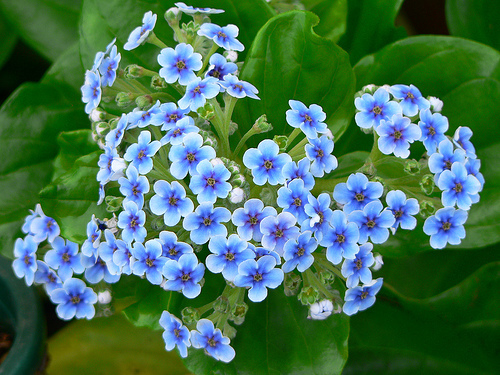 And your interpretation of the Forget-Me-Not flower is so pretty! I just love Julie Yeager's crochet patterns, I think her blocks are some of the nicest you'll ever see! The hexagons are all nicely joined up and the afghan looks great. The icy blues make me think of snowflakes! I can't have too many things on the go myself. It stresses me out. I find it's better if I have not more than 2-3 WIPs. I can't believe you are a new convert to crochet - your work is amazing!. I here you about the wips. I remember not understanding people that had more than one project on the go. Now I am comfortable with two, maybe three, but higher than that and I get overwhelmed. Your afghans are just wonderful. I agree, making a lapghan for the wheelchair person would be ideal. The advent scarf is going to be so pretty when done. My word, the afghan is beautiful. And the next one looks so intricate. Love them all. I organized with bags last year and then hung tags on the outside wit the project name so I didn't have to rifle through the bag to see what it was. I still forgot them so now I have them listed in Trello online which is a free project management software and I love it! Your blankets are just beautiful! I faved them as I knit and crochet and I love making blankets and most of them are crocheted. Forget Me Nots are one of my favorite flowers too. Gorgeous projects! I love doilies too! I always find some great crocheted eye-candy when I visit your blog. Sweet Pea afghan is lovely, and is approved by your resident crochet helper, lol. Love the flower photo, and the lapghan. It will be a fabulous gift. I'm working on doily's too at the moment. Can't wait to see yours.